In many Asian cultures, the color green represents long life and prosperity. Legend has it that jade brings tranquility to your home and good health to your spirit. These qualities, along with its vibrant red lips and pale green petals, make the Dendrobium perfect for any occasion and any room. Use the simplest vase you can find to accentuate its restful beauty or choose some of our beautiful vases below. 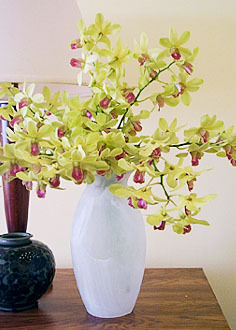 The Jade Dendrobium is arranged in our classic alabaster glass vase. For vintage and contemporary vases, view our collection. The arrangement above was created with 10 perfect stems of freshly cut Dendrobium in our classic Alabaster glass vase. Each purchase includes care instructions and an exquisite gift card for your personal message. 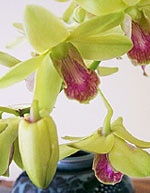 Each stem is approximately 12-15 inches tall bearing 15-18 blooms and comes with individual water vials. 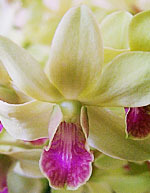 The flowers measure approximately 2.5-3 inches in diameter.